Discussion in 'Downhill & Freeride' started by freeriding, Sep 6, 2012. 1. what i understand is that chain growth is necessary in order to limit pedal bob aka anti squat. this means that some chain growth leads to high anti squat and high pedal kickback. limited chain growth leads to low antisquat and low pedal kickback. 2. is brake jack a myth? can someone analyse that? is there any suspension example which has brake jack? 3. what exactly show the line a1 and a2? how do i reduce pedal squat? 2. No. If you asked me this question a year ago I would say yes. Now that I have spent a lot more time riding i am starting to notice a lot more of the subtleties that people discuss when talking about bike handling/suspension characteristics. I notice on most of the bikes I have ridden that in braking bumps if I am on the brakes I feel some amount of change to the rear suspension, be it a total lock out, or a slight stiffening, etc. I agree with Kickstand. Being on a single pivot, regressive-type all mountain bike (namely Cannondale Prophet), it's very noticeable when the suspension stiffens as I apply the rear brake. Also, if I hit the brakes too heavily with the rear suspension compressed more than 50-60 % it dives pretty fast. 2. friction = the normal force x coef. of friction. Chain growth is generally the best way to limit pedal bob or suspension "squat" under pedaling. More chain growth, more "anti-squat"/more pedal bob. Some people use compression damping to limit bob, but it's not ideal as it can affect suspension performance over bumps. Brake jack is real but generally misunderstood. Some early suspension designs suffered brake jack. The most noticeable was the lawwill design without a floater, seen on the Tomac 204 and Schwinn 4 banger. Those bikes actually extended when the rear brake was applied. Most bikes, and most single pivots, exhibit stiffening of the suspension due to brake squat, or brake activated compression of the suspension. Not jack. I think a lot of people get confused as the suspension effectively firms up due to packing up, but it doesn't actually extend like on the tomacs. Many people believe that brake squat is actually a good thing, as it effectively slackens the head angle and lowers the COG. I think the prevalence and performance of bikes with floaters, like Trek's ABP and DW's split pivot bikes, show that a floating brake is a pretty useful device, and theoretically allows you to brake later due to having more traction and a "stable" handling bike. 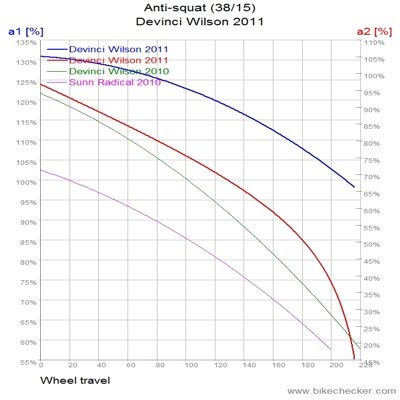 I can't tell you what A1 and A2 represent on that graph, but Anti-squat represented as a percent is a way of declaring how "good" a bike pedals. I personally hate this figure as I think it's a confusing number that only represents a fraction of how a bike will behave, but the gist is that @100% AS, you will have an equal extension of the rear suspension to the amount of force being put into it. These forces cancel each other out, and bike goes zoom. 150%, and the rear wheel extends, and 50%, the bike compresses halfway. -50% and the bike actively compresses. Yes, a bike with extending chainstays should have super short static chainstays. The best way to measure is to predict sag @ 33% travel, then designs your chainstay length around that point. If you have extremely large amounts of chain growth, then it's probably better to keep them a bit shorter @ sag than other bikes. High pivot bikes naturally reduce "Bobbing". Chain induced anti squat works well, but at the small cost of pedal kick back, and suspension lock out, that is usually beneficial, but not always. Yes as Sandwich has said, start with shorter stays for a high pivot bike. Check out the Canefield geo. I'm pretty happy with my Zerode, could be a bit shorter I guess, but I'm yet to find an unhappy Zerode owner. Brake Jack's also been explained by Sandwich quite well. I differ in that I don't mind some brake squat for the reasons he mentioned, and I find it gives much more feel to rear traction, wheel position, and suspension and wheel placement control, probably meaning better braking. It's having the bike set up to corner that's more important IMO, and I find a bit of squat helps this. Floating brakes do help you ride lazy though, and get away with a bit more. They ride loose and let you do the same. Brake jack is related to axle path and "things like that". It's no myth but as Sandwich points out. It doesn't happen any more. 4. I also agree a bit with Sandwitch and but not 100%. The 33% rule imho is wrong. Where CS length can really hurt agility is in turns and jumps and it's where suspension is loaded and we are way beyond 33%. So if 2 bikes are 17.8'' for example in the rear at sag but one grows 0.5'' and the other only 0.2'' the feel in corners and jumps will be very different. The rest of his points are spot on. I am also not a fan of speaking about everything with anti squat. It became more of a marketing term than anything since it's derived from other suspension parameters anyway. Brake squat is related to axle path and "things like that". It's no myth but as Sandwich points out. It doesn't Have to happen any more. I think the majority of bikes still have it. Every single pivot without a floater has it, every Faux bar without a split pivot does too. Although there's lots of great VPP and now split pivot style bikes available(and Horst Link), single pivot still seems the most common design available. And a lot of other bikes will still brake squat to a degree. Sorry I was speaking about brake jack and writing about brake squat. Edited that. Have a read through the theory section on my website. It's a comprehensive explanation of the topics you have raised. I figured it was something like that, but couldn't work it out. my only qualm with that is that for most bikes with large amounts of chainstay growth, most of the growth happens in the first part of the travel. They start to decrease growth (linearly? exponentially?) as the axle gets closer in line with the main pivot, where it will actually start to move closer to the bike again. So, the right way to test is to build it and ride it, or to run a thousand mathematical configurations to determine approximate chainstay length under different circumstances and positions. Personally, I'm willing to bet that if a bike rides the way you want it to under sag, it'll ride close to that at 66% too, unless it's really weird. and beyond that point the benefits of a longer rear stay from stability becomes more beneficial IMO. I think Sandwichs above comment is probably a pretty sound ideal. Hey Sandwich, thanks for that wonderful explanation. I realise I was -as you pointed out- confusing brake jack for suspension stiffening or brake squat. wait, what? All bikes with a main pivot above the chainring will lengthen for at least part of their travel, regardless of idler. Very high pivot bikes lengthen the whole way until bottom out, unless the axle goes over the pivot. Idlers help with chain growth. I agree with NSM though, I think high pivot bikes naturally cancel out some suspension movement due to pedaling simply by moving the riders fulcrum from RIGHT ON THE PIVOT to very far away from it, making the rider's force on the suspension less. In practice, my 9" travel RL pedaled better than my 5" travel arrow DS3. The RL had very small or negative amounts of chaingrowth/antisquat. I wasn't really talking about chain growth. Just pointing to a group of bikes with a constantly rising chainstay length where you need to be aware of how it changes for more than the first 33% of travel.